For years it was instantly associated with smooth late-'70s productions, and now the sound of the electric piano is enjoying a comeback. But just how good is Native Instruments' sample-based virtual version? Hands up anyone who hasn't heard of Native Instruments... thought so. When it comes to virtual instruments, NI produce some of the best around; some of them have yet to be beaten in my opinion, including such gems as Battery, Kontakt, and B4. Elektrik Piano is a virtual rendition of four legendary 'old faithful' electro-mechanical keyboards, namely the Fender Rhodes MkI, the Fender Rhodes MkII, the Hohner Clavinet E7 and the Wurlitzer A200 — a revered set of instruments by anyone's standards. 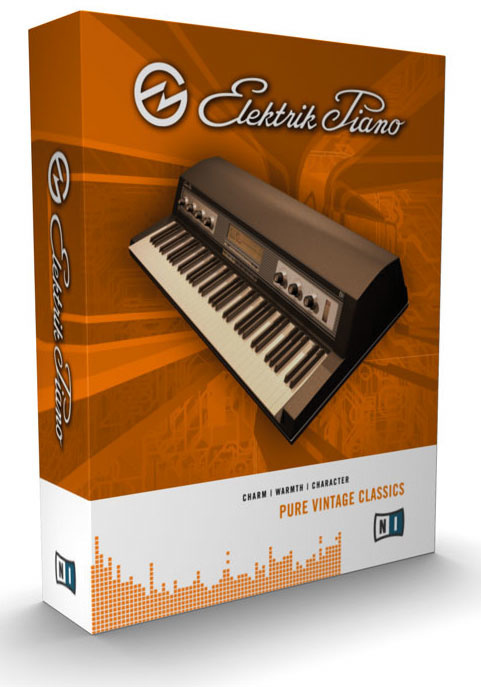 Elektrik Piano is available for Mac and PC. The Mac version supports VST, Audio Units, RTAS, Core Audio and Core MIDI, and requires a minimum specification of Mac OS 10.2.6 and a G4 867MHz processor. The PC version supports VST, RTAS, DXi, ASIO and Direct Sound, and needs a minimum spec of Windows XP and a Pentium 3 or Athlon 800MHz processor. 2GB of hard drive space and a minimum 512MB of RAM is required on both platforms. For the purpose of this review, I primarily ran the instrument as a VST plug-in under Cubase on my 2.4MHz Athlon-based PC with 1GB of RAM and can report that it worked flawlessly. Elektrik Piano uses a sample-based audio engine with individual samples taken for every semitone across the keyboard at various velocity levels. Separate samples have also been taken of the release phase of each instrument for added authenticity. Usefully, the sample material can be loaded straight into NI's Kontakt sample player, which affords possibilities for some serious mangling should the mood strike you. I found the Clavinet samples to be particularly good in this respect, being chunky and full of body, unlike many of the synth emulations we're more often exposed to. I really like the look of this plug-in. I might wish it was slightly bigger on my 1024 x 768 resolution screen, but everything from the faux- Fender logo to the shading around the silver knobs gets brownie points from me. Over to the right of the panel are the tuning, pan and volume controls, with attendant VU metering. Tuning is available over a ±12 semitone range, while holding the Shift key allows for fine adjustment in cents (hundredths of a semitone). Use of the Shift key to reduce the range of knob movement works across all of Elektrik Piano 's controls. NI have designated each of the four sampled keyboards an Instrument and each of the processed variants of the Instruments are named Presets. Each Preset comes with a flavour of effects or EQ treatments built in. The centre of the display shows the current Instrument and active Preset. You can choose a Preset by navigating through the 'File' button, or by using the plus or minus buttons to step through them in series. The F1-F8 buttons can each be loaded with a Preset for fast access and these are recalled by clicking the button, using the computer keyboard's F1-F8 keys, or by using a MIDI program change from 1 to 8. Helpfully, the assignment of the Function buttons (and, indeed, the position of the control knobs) can be saved in a Performance file. Over to the left of the panel are four controls that change assignment depending on the currently selected Preset. They variously become depth, speed, amount and frequency controls for the various reverb, chorus, phaser, panner and equalisers assigned to each Preset. The knobs can be accessed over MIDI by use of controller numbers 20-23, which is helpful for automation or live use. It would be nice to be able to change the MIDI controller number assignments, perhaps to map phaser depth to a mod wheel, or overdrive amount to a breath controller, for example, but NI have gone for a simple approach here. The amount of tweaking is limited; there are no Presets that feature chorus, phasing and reverb all together, for instance. The range of control is also quite conservative — I would have liked to dial in more distortion, for example, but the drive control runs out just when things begin to get interesting. NI make great play about Elektrik Piano being simple to use and this certainly holds up, but some users will have to reach for other plug-ins if they want to spice up the basic sound of this instrument. Just below the main panel are a number of indicators showing MIDI channel (Elektrik Piano is monotimbral, but you can of course load more instances up to the limit of your computer's disk/processor resources), current polyphony count, memory usage, CPU usage, and whether you're using Direct From Disk (DFD). DFD is a useful RAM-saving feature available as an update from NI's web site (though it does increase the strain on your hard disk, obviously). A number of 'economy-sized' Preset variants are also available on the web site, which is a helpful option if CPU resources are getting tight. Although Elektrik Piano 's front panel is relatively simple, there are a number of controls hidden behind the Option button that enable you to take greater control if necessary. Amongst the general options are a master tune control, a memory-locking option (for those who are sure they have sufficient RAM and want to reduce disk throughput — essentially, this is the exact opposite of DFD) and a switch offering 32-bit sample playback. If you need Elektrik Piano to respond to standard MIDI volume and panning controllers, you can also arrange that on this page. Usefully, you can also set the path for your Instrument sample data. This enabled me to hive the samples off onto my second hard drive to keep them away from my swap-file activity and also avoid taking up valuable space when I back up my main drive — if only all sample-based virtual instruments were so accommodating! Keyboard options are included to allow MIDI transposition over ±24 semitones, to define a playback key range and to set pitch-bend response over ±12 semitones. Velocity response is adjustable, but this is simply a slider control producing a concave/convex velocity slope (this is shown on a graphic to the right of the slider). Given the highly personal nature of realistic piano keyboard responses, I would maybe have hoped for a little more control here, perhaps to ramp the top or bottom of the curve, for example. Elektrik Piano will function correctly with both sustain and sostenuto commands over MIDI, though there are options to switch off this ability if required. The stand-alone version of Elektrik Piano has a number of other options for assigning audio and MIDI ports, but this is all pretty standard stuff and worked just as expected. In fact, I had a very easy, crash-free time with this instrument using it both under Cubase (SX2 and SX3) and as a stand-alone instrument. That's the mechanics, but how does it sound? Not bad at all. In fact I'd go as far as to say it is probably the most accurate rendition I've heard of these classic instruments. Samples have been taken for every semitone, so there are no nasty tonal jumps across the keyboard, and I certainly didn't find any duff samples. The electric piano can be difficult to render smoothly with samples — I've heard many attempts using decent-sounding samples which nevertheless don't play like the real thing because of poor velocity switching. Things aren't perfect here either, but Elektrik Piano is very good nonetheless. There are several velocity layers in action — certainly enough to smooth things out in a mix. But I can still hear tonal 'jumps' between these velocity ranges and, put simply, the more you notice them, the more annoying they become. I must keep this in proportion, though — Elektrik Piano is a far better emulation than any other sample CD or synth I have heard to date. I just wish someone could nail this velocity switching problem once and for all! The Fenders arguably suffer most of all in this respect, given their bell-to-bite nature across the velocity range. The use of release samples is transparent, and that's the way it should be. I tried hard to hear any clicks, or obvious crossfades on key release, but I couldn't spot any. The Wurlitzer A200 Presets benefit greatly from this feature; I find the slight 'choking' of the A200 voicing during release one of its most endearing traits, and NI have captured it beautifully. It was gratifying to launch into my painfully limited renditions of Supertramp riffs and hear such a close copy of those glorious tones. But for me it's the Clavinet Presets that are the stars of the show. There's plenty of body to the samples here, and the chorused, filtered and phased variants are simply wonderful. I had to reach for an external plug-in to get a satisfactory flanged Clavinet, but I can forgive it that — the source material is just gorgeous. I admit it — I'm deeply impressed! There's still the little matter of the lumpy velocity switching, but this is still the best set of electric piano/Clavinet samples I've heard to date, and believe me I've heard a lot — old and new! The pianos are great, the Clavinet is excellent, and the number of variants in the form of EQ and effects should please all but the pickiest players. The picky ones can just add some plug-in effects, and then they should be happy too. Comparisons are readily available. The most obvious alternatives are likely to be Emagic's EVP73 and Applied Acoustics' Lounge Lizard. Good though these instruments are, I feel that Elektrik Piano exhibits a more authentic depth and vibrancy. It also seems somehow more 'playable' to my fingers, but that is undoubtedly going to be a subjective matter. I'm sure Native Instruments have another winner on their hands here — even the price is right. If you're reading this, guys, might I suggest VSTi versions of the ARP Pro Soloist, Moog Taurus pedals, Mellotron, Optigan... at this rate I might soon be able to gig without the aid of a truck! Great use of release samples for added authenticity. May be short on control for some power-users. The best set of electric piano/Clavinet samples I've heard. The interface is simple to use, which will endear it to live users and anyone who wants to get the job done with the minimum of fuss. The lumpy velocity switching is a shame, but it's still way better than other sampled electric pianos I've heard to date. Highly recommended.